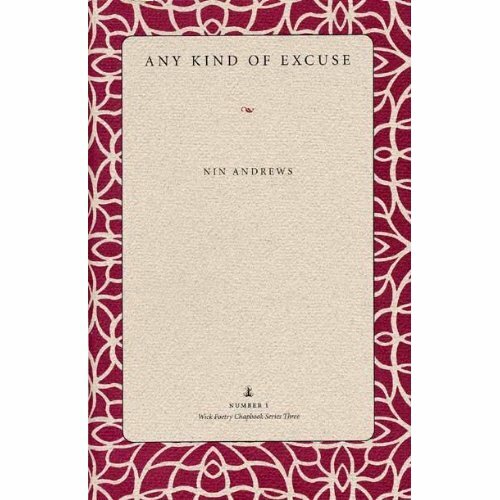 Nin Andrew’s beautiful little collection of poems, Any Kind of Excuse, is the third chapbook in the Wick Poetry Series. The entire chapbook is a series of poems narrated by a young girl growing up on a Southern farm.Andrews’ narrator’s voice is clear and unwavering, innocent yet observant. This landscape she has created is populated with farm-hands named Jimmy, a rooster that won’t stop crowing, and a grandmother who predicts deaths. I would recommend Any Kind of Excuse as a great example of how poems can function together as a series in a complete collection.